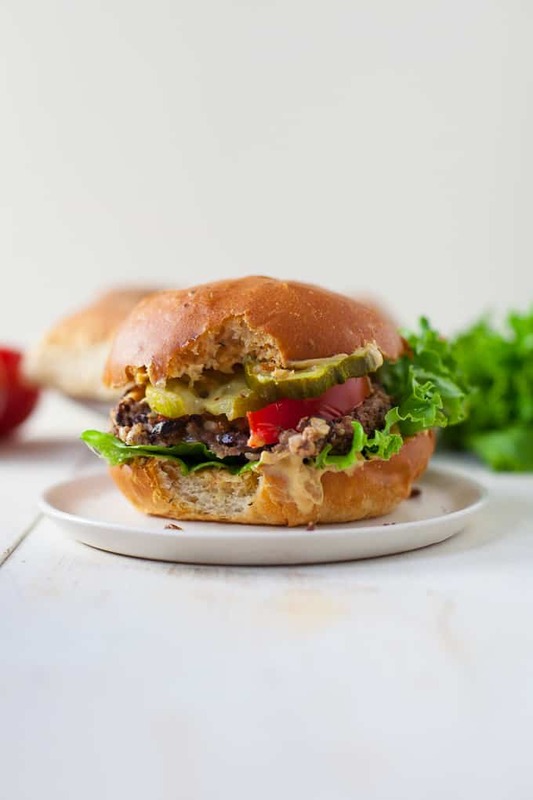 A plant-based burger you’ll definitely want to sink your teeth into. 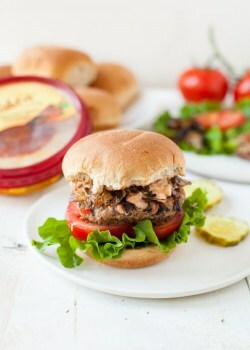 This mushroom black bean veggie burger is perfect for summer BBQs and cookouts! Summertime is for veggie burgers in our house. I love making a big batch of homemade veggie burgers on a Sunday evening and being able to freeze leftovers for future weekday nights when we don’t have as much time to cook. 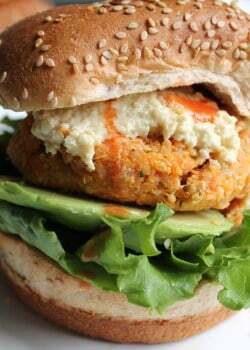 I also can never get bored with veggie burgers because there’s so much room for customization in terms of ingredients and flavor profiles, hence my Buffalo Quinoa Chickpea Burgers and my Spicy Hummus Black Bean Burgers. And in today’s burger, mushrooms and black beans are taking the spotlight. 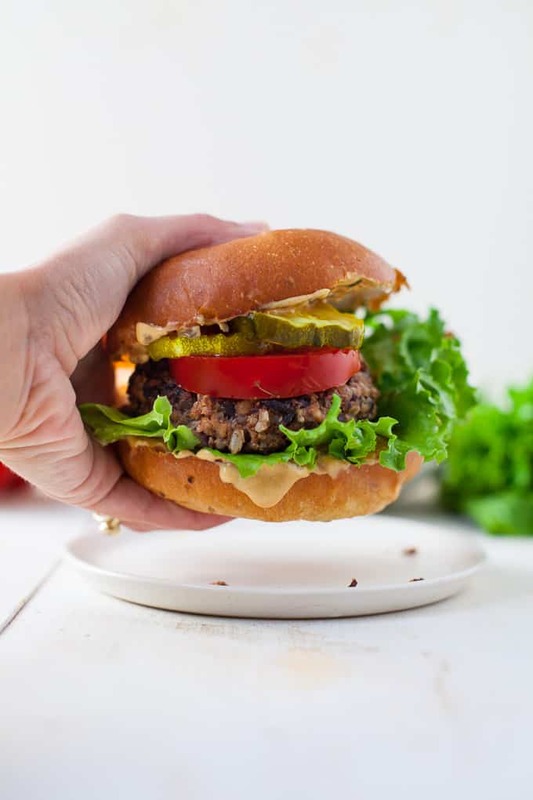 A simple formula for veggie burgers is protein (beans, lentils, tofu) + grains (quinoa, brown rice, bulgur) + veggies (onion, garlic, bell pepper, mushrooms) + dry base (oats, quinoa flakes, breadcrumbs) + binder (egg or flax egg) + spices + sauces. Today’s recipe used black beans + walnuts + onion + shiitake mushrooms + garlic + quinoa flakes + egg + miso + greek yogurt + chili powder + chipotle powder + cumin! And of course topped off with a special sauce. I’m all about the sauces. We’re about six weeks into our CSA now and we’ve been loving pairing our veggie burgers with our CSA corn on the cob and lettuce for salads. And even though they aren’t in our CSA, we’ve also made some pretty delicious homemade sweet potato fries to accompany the burgs. We’ve made these on our George Foreman, cast iron grill pan and non-stick skillet and I think the George Foreman and non-stick skillet worked the best. 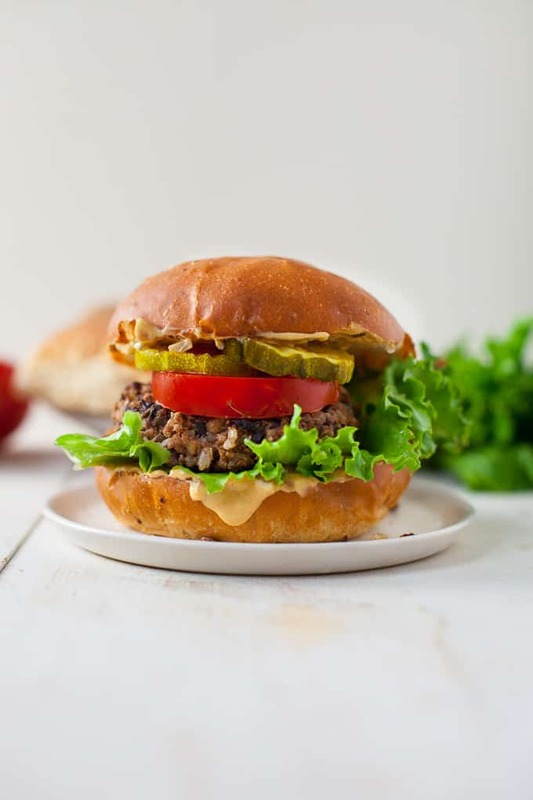 Toast the hamburger bun and pile high with toppings like lettuce, tomato, pickles, cheddar cheese and that special sauce. 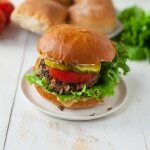 Enjoy these burgs at your next summer BBQ or get together! This weekend is my last weekend at home before I head off to Europe in August so I’m planning to polish off these burgs before I leave! I’m heading to Copenhagen for a work conference and then venturing off to Prague, Berlin and Munich to explore. 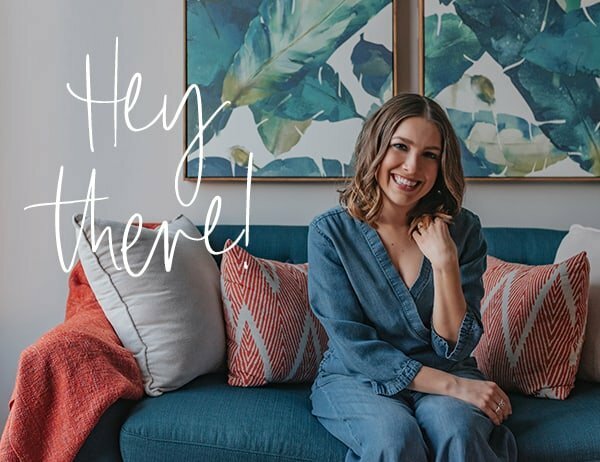 If you’ve been to any of these cities, I’d love your travel recommendations! Arrange mushrooms in an even layer on baking sheet, drizzle with 1 tablespoon olive oil and season with salt and pepper to taste. Roast mushrooms until tender and shrunk in size, about 12-15 minutes. Let cool. Pour black beans onto baking sheet and roast until dry and split open, about 7-10 minutes. Let cool. Heat 1 tablespoon olive oil in medium nonstick pan over medium heat. Add onions and cook until translucent, about 5-7 minutes. Add garlic and cook for another 60 seconds or until fragrant. Let cool. In a food processor, pulse walnuts and quinoa flakes until finely chopped. Add mushrooms, beans, onion and garlic, and brown rice and pulse until combined and finely chopped. In a large bowl, whisk together egg yolk, miso, Greek yogurt, chipotle powder, chili powder and cumin. Add burger mixture to bowl and mix until combined. Salt and pepper, to taste. Form mixture into 6-8 burger patties. Heat 1 tablespoon olive oil over medium heat in nonstick or cast iron skillet. Cook patties until browned, about 5 minutes on each side. If using cheese, place slice of cheese over top of burger, cover and let cheese melt for about 1 minute. Serve on buns with special sauce and desired toppings. In a smal bowl, whisk together, yogurt, ketchup, relish, mustard and sriracha. Spread on hamburger buns as desired. 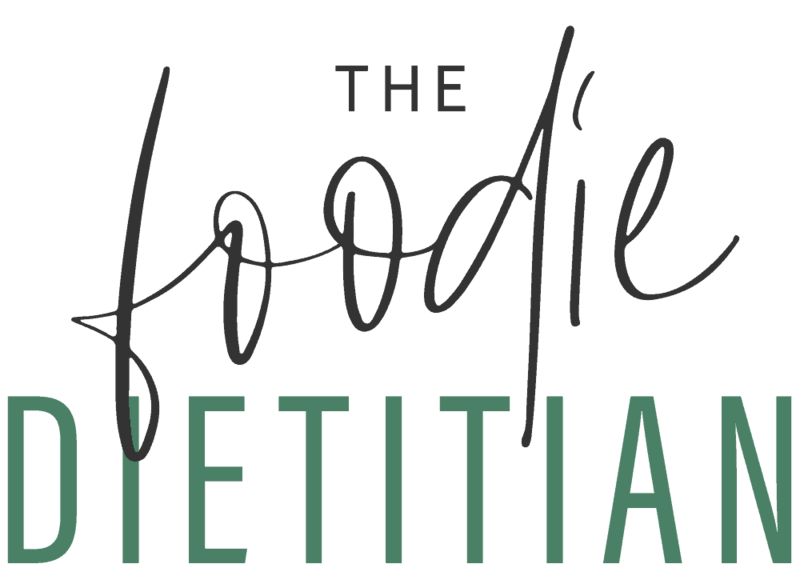 Tell me, what’s your fav go-to burger recipe? 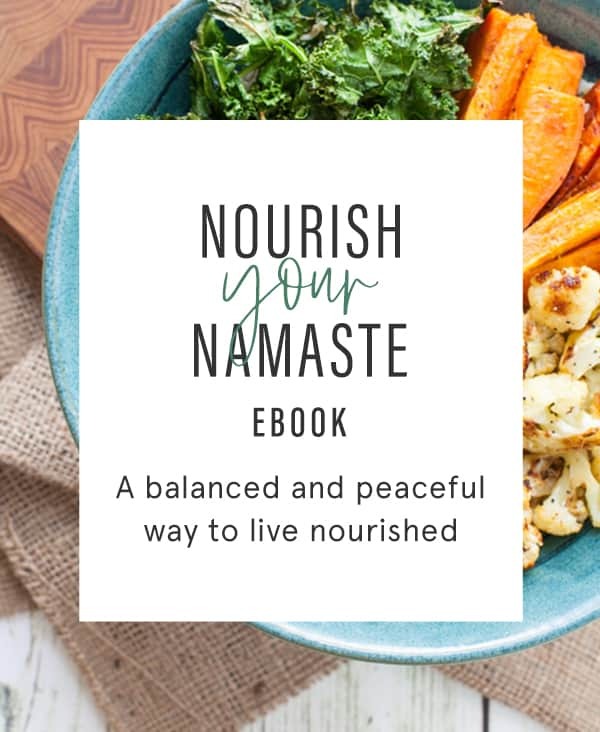 For more veggie burger inspo, check out my recipes below! The ingredients looked so good. And so expensive. I made these and ate one and threw the rest away! 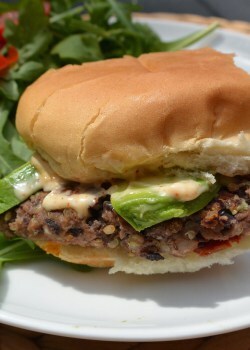 The mushiest veggie burger ever made. Nobody likes a mushy burger. Finely chopping all the ingredients is a big mistake. Quinoa flakes $11 a box. Shiitake mushrooms $16 for a lb. Miso $7. And more ingredients…. Hey Kate – so sorry to hear you had a negative experience with these burgers. I’ll have to retest this one and see how I can improve it! This looks Awesome.! I cannot wait to taste it.! !